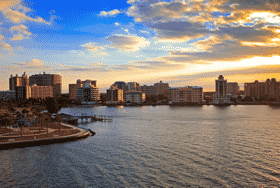 5With its 40 miles of white sand beaches and turquoise water, as well as a bay front with city views, Sarasota County, FL was named a USA Today’s Great Waterfronts to Visit Across North America Top 10 List. That’s what makes a Sarasota beach vacation unique and the perfect destination. Whether you’re taking in the view from the beach, in a boat or kayak, or from the comfort of a waterfront restaurant, Sarasota and the surrounding keys have plenty of opportunities to enjoy the beautiful views. Sarasota County, and its string of eight islands are tucked into the Gulf coast of Southwest Florida, 60 miles south of Tampa and 75 miles north of Fort Myers. Sarasota County includes Sarasota, Longboat Key, Lido Key, St. Armands Key, Manasota Key, Siesta Key, Casey Key, Englewood, Nokomis, North Port, Osprey, and Venice. Longboat Key is known for its private beaches and calm surroundings. However, there are a few public beaches where visitors can enjoy the peace and serenity of a true Florida paradise. Far removed from the busy beaches like Siesta Key, Longboat Key is the ideal spot for calm and quiet beach activities. The city of Sarasota has a plethora of artistic and hip places to explore. Art museums and galleries, shopping malls, coffee shops and fine dining all define local life in Sarasota, FL. Downtown Sarasota has easy access to the bay front water, where you can walk along the water next to unique sculptures from artists around the world. Siesta Key Beach was dubbed “America’s Best Beach” by Dr. Stephen Leatherman, a.k.a. Dr. Beach in 2011 and was named TripAdvisor Traveler’s Choice for the best beach in America earlier this year. With plenty of people enjoying the beach, you’re bound to run into a little bit of a crowd, but for people who are looking to enjoy the company of others, it’s a great spot. Though there are many other areas of Sarasota County not included, we encourage you to explore your options when visiting Sarasota for your next beach vacation. The best way to escape into the beach life is by renting a Sarasota rental property with Jennette Properties. Trying to locate the right luxury property in the most sought after areas can be a daunting task. With Jennette Properties, you can be assured that our team is dedicated to helping you find a suitable seasonal or long-term rental that will fit your needs. Contact us today to start planning your next Sarasota adventure.